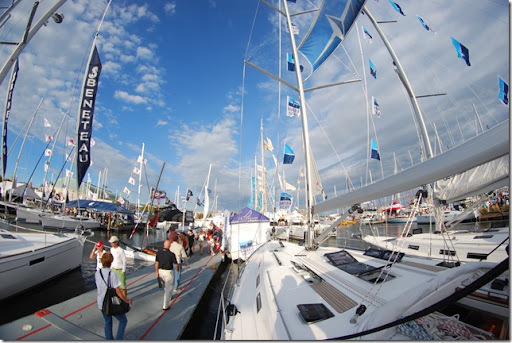 The boat show madness has finally ended! “Work hard, play hard,” was definitely our motto throughout the entire show. 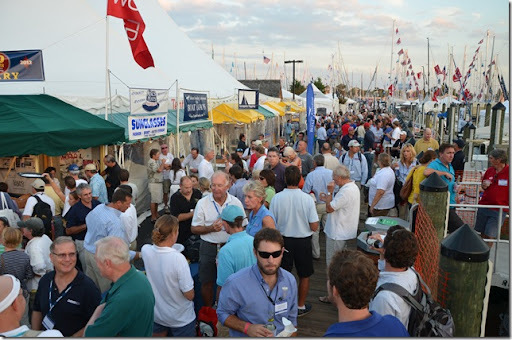 If you ever want to network in the sailing community, the Annapolis Sailboat Show is the place to be! 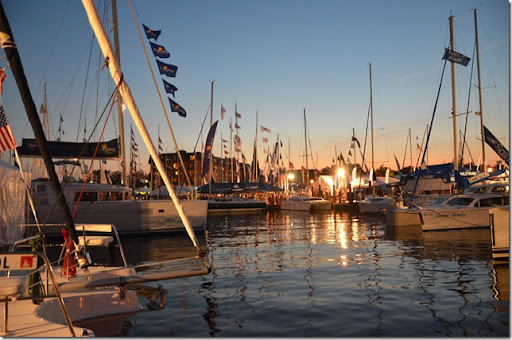 We made so many amazing new friends, got to see plenty of cool boats, drank lots and lots of painkillers and worked hard detailing and selling the yachts. 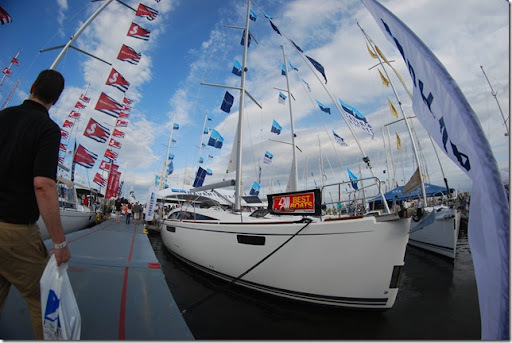 Matt and I got a job with Absolute Boat Detail before the show detailing Fountaine Pajots and Lagoons. Matt cleaned the exteriors while I cleaned the interiors. One lesson learned: If you’re ever thinking of buying a catamaran, detail it first, so you know how much time it’s going to take you to maintain the thing! 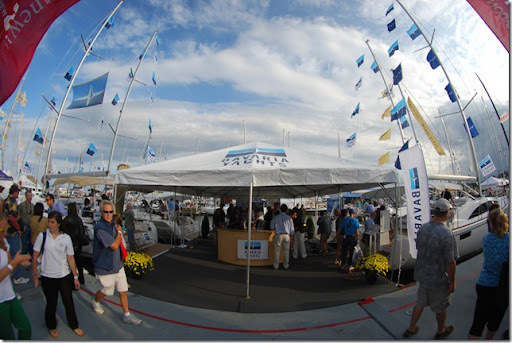 At the boat show, Matt sold for Catalina and I was the hostess at Bavaria. 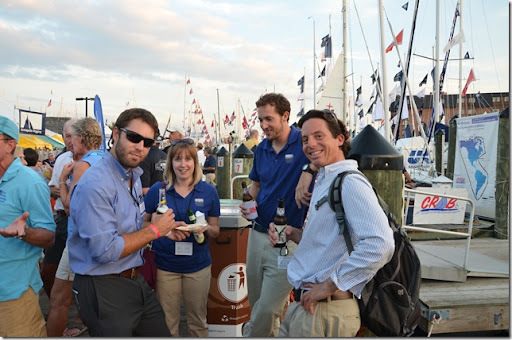 I absolutely loved working with my Bavaria family and our partners, Horizon Yacht Charters. They are absolutely so much fun to work with and I can’t wait till I see them again. We also had some special guests that we were excited to see again. Our friend Steve from New Orleans came up and stayed for a couple of nights, Barbara from Orlando had dinner and drinks with us after the Sailing World party, Jay and Tim stopped by from the Capital Yacht Club, Karen and Cookie from Norfolk said hi and took us out for appetizers after the show and Phil and Annette, our great friends from Young’s Boat Yard, made their way down from Baltimore to wish us farewell one last time. 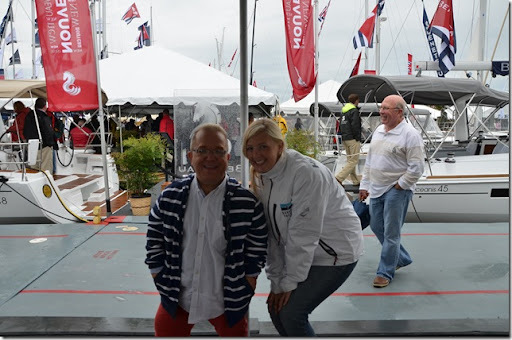 We also met some of our awesome readers like Sarah, a cool young sailor that works in the Bahamas for part of the year; Anthony and Annette, a couple working to make their sailing dream a reality and Peter, who spent a month in the Exumas on his powerboat last year. 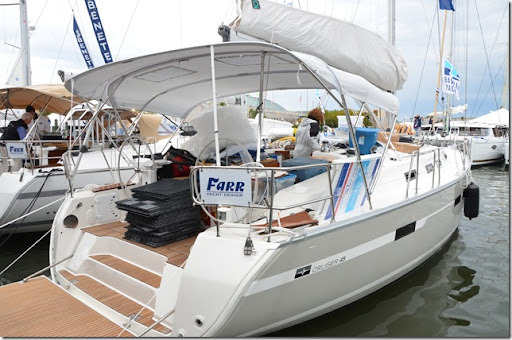 The best part about sailing and cruising is that no matter who you are or what your story is, suddenly you are a part of an awesome community because of your common interest in being out on the water. Everyone at the boat show knows how to start the evenings off right with painkillers, a drink made up of rum, pineapple juice, orange juice, cream of coconut, an orange slice, cherry and nutmeg. From there we would move on to the daily parties. It’s painkiller time with our Aussie friend, Adam! 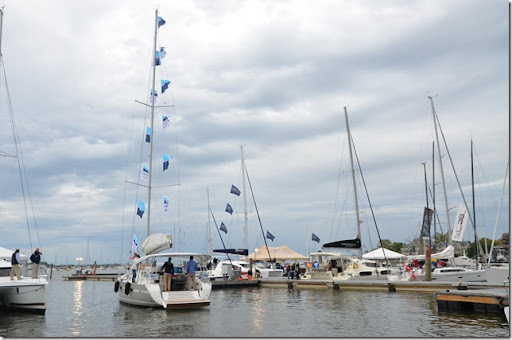 The first night was the Sailing World party and Rain Gutter Regatta. 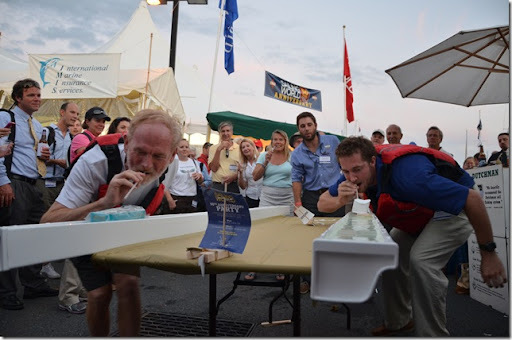 The object of the Rain Gutter Regatta was to have teams of two from different businesses, build a boat made out of materials that were provided by Sailing World. 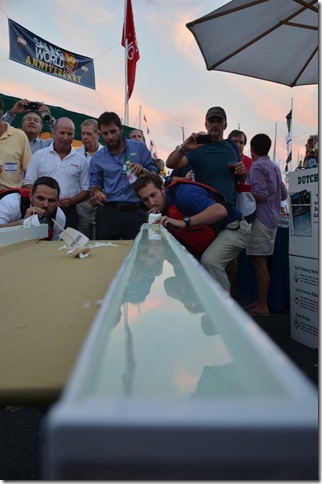 The teams brought their boats and raced them by blowing them with a straw down rain gutters. 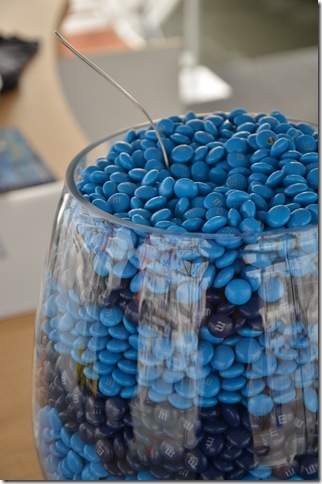 It was no surprise to us that Bavaria won first place! 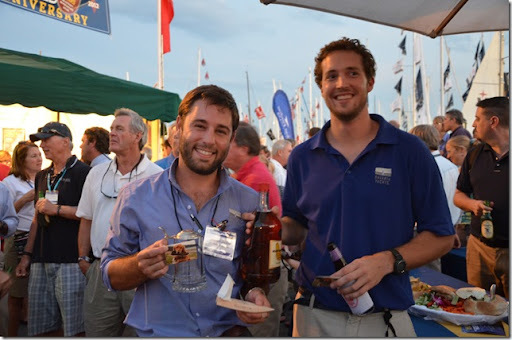 My cousin, Hunter, and his friend, Cameron, won a handle of rum, a Sperry’s gift card and engraved mugs. Not too bad for building a boat at the last minute. 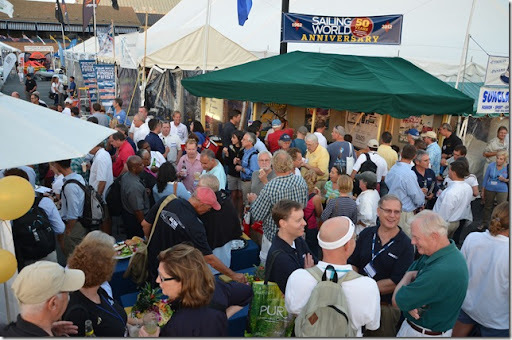 Another night we started the evening off with the Catalina party, then we were off to the Jeanneau party and after that we made our way over to Eastport for the Selden party. During the nights in between, we frequented the local favorites, Boatyard Bar and Grill and Davis’ Pub. It is needless to say that we’ve had enough fun to last us awhile. 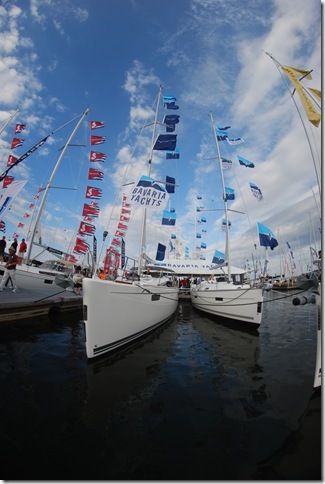 As quickly as the boat show came, it also went. The last day was incredible. What once was a city on the water became open waterfront in the matter of a couple hours. 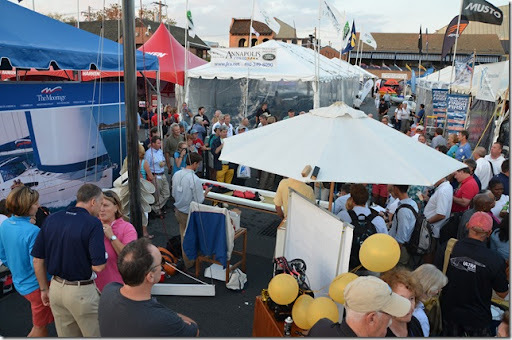 We threw everything that was in the tent on the boats and headed back to the Bavaria office in Eastport. 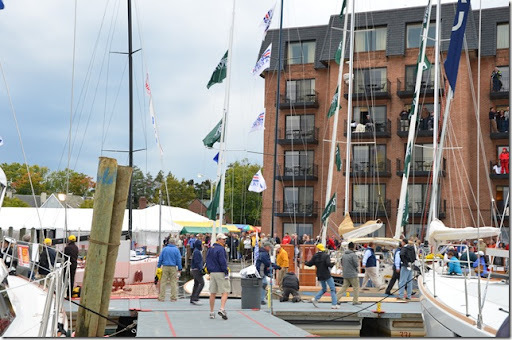 A huge crowd formed to watch the breakdown process and everyone cheered when a J90 and J70 sailed out of the show with their spinnakers up. 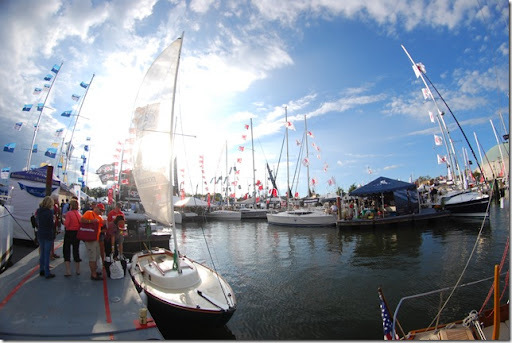 It was a great way to end the show and maybe we’ll be back for Annapolis Boat Show 2013! So you've met Rocky, eh? 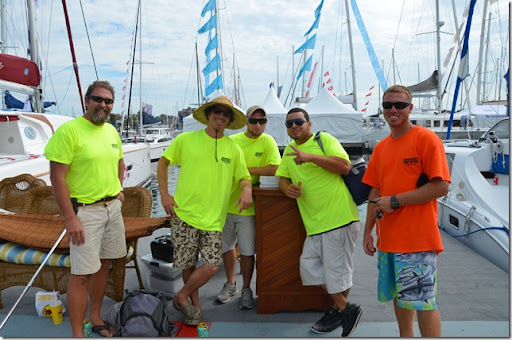 Over the weekend he spoke of the seemingly endless acres of catamaran gelcoat and the hard work of his crew. It was quite a job. I'm glad we were able to get it all done for him though. He's a good guy and I had a great time hanging with him. Thanks so much for everything. 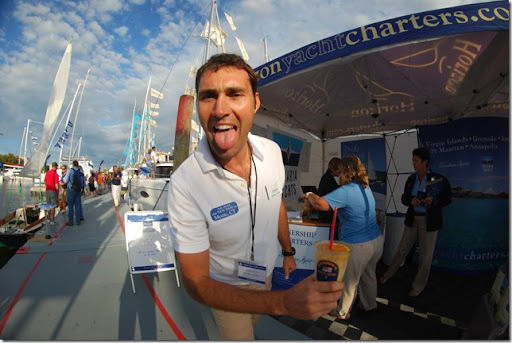 It was nice working with you and can't wait to see you in the BVI. How could I ever forget grapeknutz! What a classic. Look forward to getting back down to New Orleans here the beginning of November before headed over to the islands.